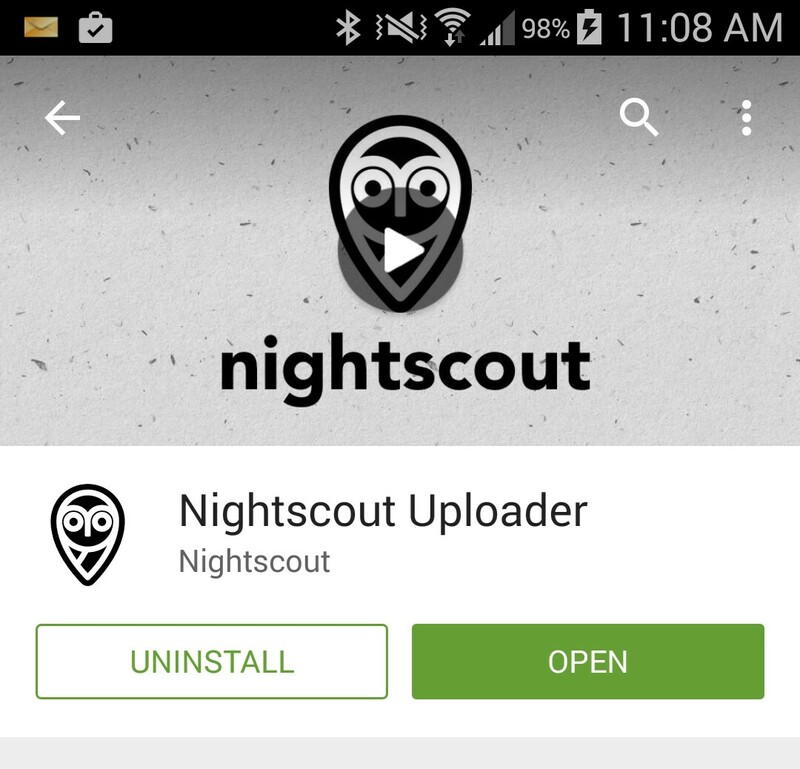 Installing Nightscout on the uploader phone. 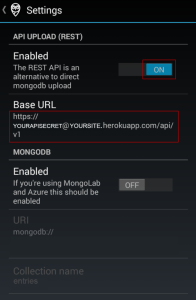 Configuring the uploader application using the Mongolab connection strings. 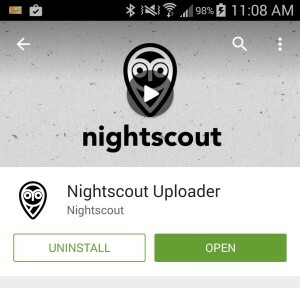 As a prerequisite to installing the Nightscout app on your uploader phone(s), we recommend that you install any and all available Android software updates. 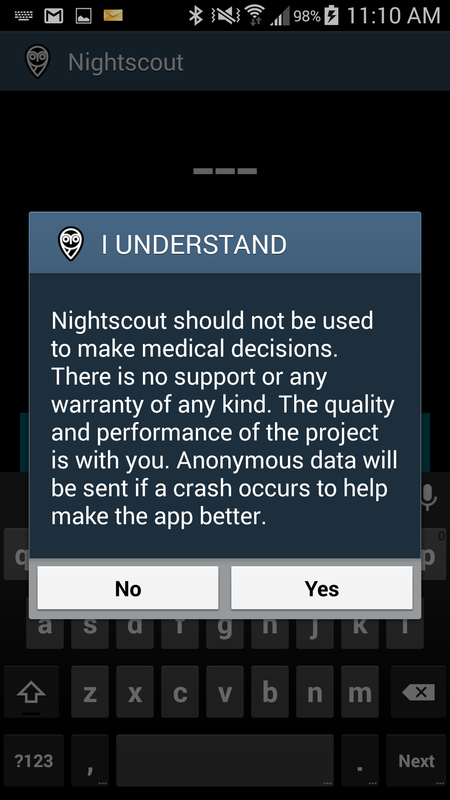 If you do not, the Nightscout app may stop uploading data when an Android system update notification pops up. To install updates on a Moto G phone, go to System > System Update > Update Motorola Software. A cell plan is not required for this step. We recommend you use wifi only during installation. All of these steps are performed on your uploader phone/device. It will not work to do this from a computer. It must be from the uploader phone. Using the uploader phone, connect to the internet via wifi or cell connection. Click on the Google Play Store icon on your uploader phone. Input your email address and password in the appropriate boxes. Select OK to agree to the terms of service. Unselect the boxes to Backup & Restore (This will try to download all the apps and data from a personal android device if you have one. You do not want this to happen) and Communication. Search for Nightscout in the search box at the top of the screen. Select Accept and the app will download and install. 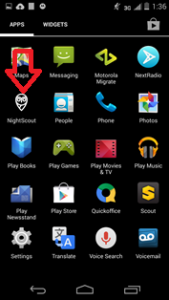 If it does not open, go to the menu on the home screen and scroll until you see Nightscout. 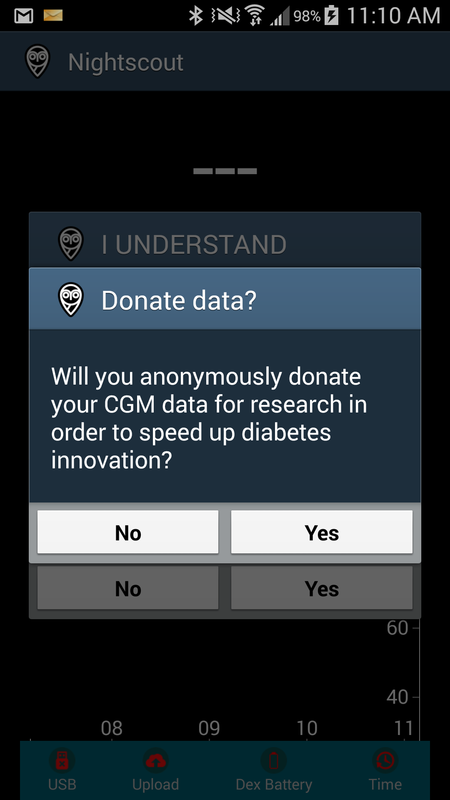 Read and respond to the “Donate Data” pop-up screens. PLEASE READ and agree to the “I UNDERSTAND” disclosure by selecting YES. Once the Nightscout app is open, open the Preferences screen.Your uploader screen may not look the same as this. The Preferences (3 vertical dots) may be in the upper right or in the lower middle of the screen—depending on which Android phone/device you are using. Or you might need to tap the menu button on the phone itself, not on the screen. (Note: Any reference you see to mongoDB upload is out of date for the Nightscout upload ap as of 10/1/15. If you are using a different uploader that supports mongoDB upload, consult uploader-specific directions for configuration. )To configure API Upload (REST): Ensure that “Enabled” is ON, or the slider switched to the On position In the field that pops up, you will need to enter a string that combines your API_SECRET value (minimum 12 characters) and your website address. If you have set up your elements out of order, you may need to come back to this step after setting up the Azure or Heroku website. 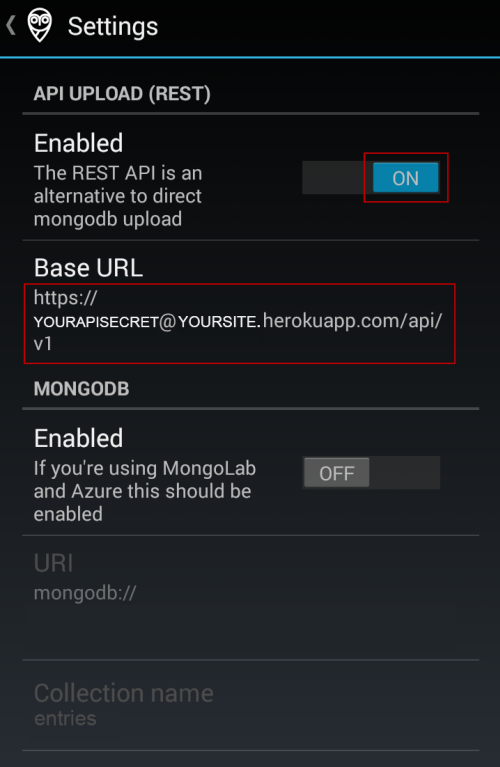 You will need the API_SECRET that is used in Azure or Heroku and you will need your website name to configure the REST API upload. Earlier Nightscout installations used MongoDB as upload method —this method will no longer work for the Nightscout app. 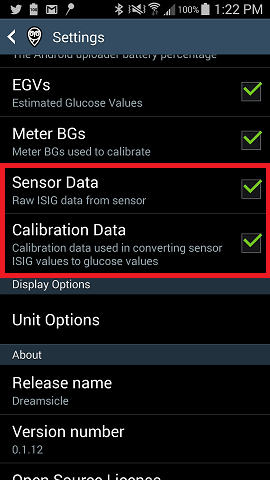 If you need to change the units from mg/dL to mmol, tap Unit Option and then select your choice in the pop-up menu. Touch the Back button to exit the Preference Menu. You are now ready to connect your Dexcom. 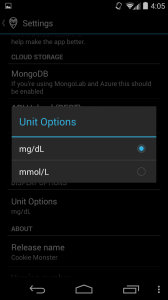 With Mongolab now set up, the application should be able to start uploading in the next steps. On your Dexcom, click into the Utilities/Date & Time and verify that every part of the time hh:mm am/pm and date mm/dd/yyyy are correct. Check your uploader time setting. Make sure it is set to the correct timezone and has the correct time and matches the Dexcom. Do NOT move on until you have checked the time/date setting. 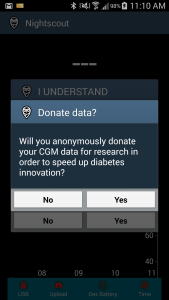 Connect the Dexcom receiver to your Android phone. 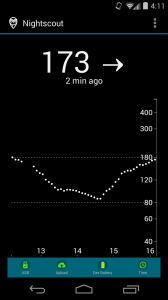 IMPORTANT: when connecting the phone to the Dexcom, the OTG cable plugs into the phone. The regular USB cable plugs into the Dexcom. It will not work the other way. During the initial connection, there may be a pop-up asking if the app should have permission to run / access services. Tap OK. 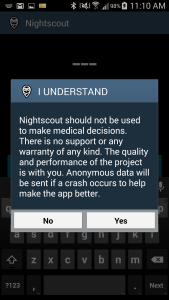 The Nightscout app should load. 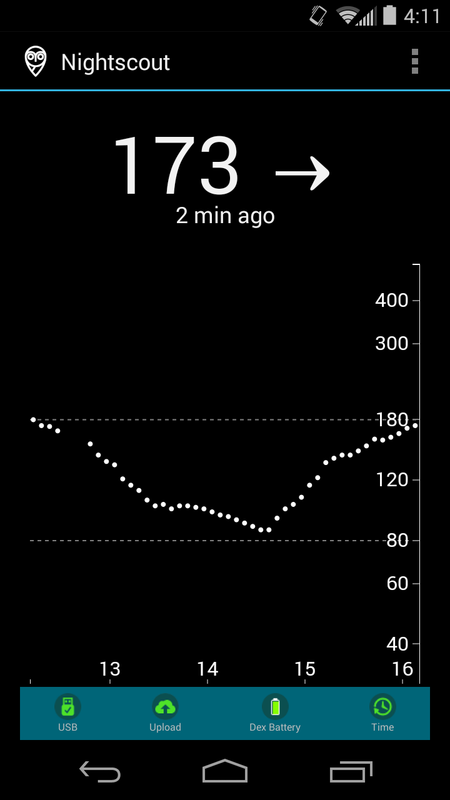 Do you see the Dexcom reading on the screen of the Nightscout app? Is the CGM showing a charging symbol on the display when you plug the cables together? Are any of the icons at the bottom of the Nightscout app screen red? If you’re still not getting a connection to the CGM, it could be due to bad cables. THIS IS NOT UNCOMMON! Try swapping out new cables and continue to test. 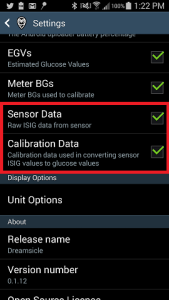 You WILL NOT be able to proceed until you achieve a current BG number reading on your Nightscout app. If you followed the recommended sequence of steps to set up Nightscout, you have already configured your Azure (or Heroku) website and confirmed that the site was loading with a black page showing time and dashes before installing the uploader app. Now that the app is configured, you need to confirm that the website is receiving data from the uploader. First, wait 10-15 minutes after setting up the uploader app and then try reloading the page in a browser. If you see current data, your installation is complete. If you do not see current data, continue to the next troubleshooting steps. If your new site is not showing current data, look at the bottom of the uploader app screen on the phone. The “upload” icon shows whether or not your phone is actually connecting and uploading documents. If it is red, your phone is not able to upload documents. You need to find why your phone is not successfully uploading data. Verify that you have a working Internet connection on your phone. If you also have a cellular data plan on your phone, and are currently using WiFi, try turning off WiFi and see if makes any difference running off of cellular. If you don’t have cellular data, but possibly have another WiFi hotspot to connect to (i.e. 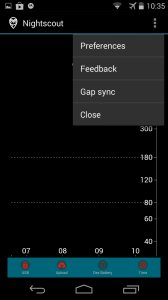 another smartphone with hotspot feature or tethering), attempt connecting to that as well. 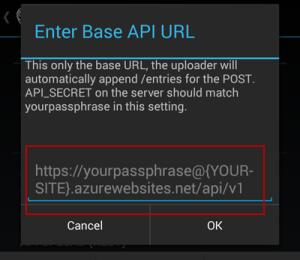 If you are sure your phone is connected to the Internet and you still do not see current data, you will need to carefully doublecheck your base url for the REST API upload. Does the API SECRET match what you used in Azure? Is the API SECRET at least 12 characters? Is your base url using the correct syntax for your uploader app (e.g., https://YOURSECRET01@YOURSITE.azurewebsites.net/api/v1).